Since childhood we remember that the best gift -Present, made by own hands. Being small, we selflessly made appliqués and cards for mothers, grandmothers, dads and other relatives. Our relatives admired "creativity" and carefully folded all the crafts. Now though the times have changed, but trinkets,Made by own hands, still please the heart. So today I want to talk about how to sew a cat out of felt. This toy looks very cute, can be decorated to your taste and will carry a piece of your soul and your positive energy. 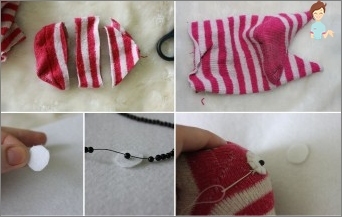 Beads, buttons or pieces of fabric to create a spout and an eye cat. You can buy ready-made nose and eyes in specialized stores, but they will need to purchase glue. When all the materials are ready, you can start creating a toy yourself. It should be noted that felt is selected asMaterial for crafting for good reason. 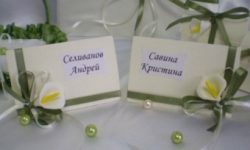 The material is very simple in work: it has a dense texture, but it is soft and pliable, and the edges do not crumble when cutting. In addition, felt is sold in large quantities and has a wide range of colors. It is quite pleasant and expands the field for creativity. If you plan to make not a small seal, but a soft toy of a large size, then the fleece will do the same. But this was a lyrical digression, let's return toThe creation of a cat. First, draw a piece of paper on a sheet of paper. It can be like an animal in "full" growth, and only muzzle. Cut out the workpiece. 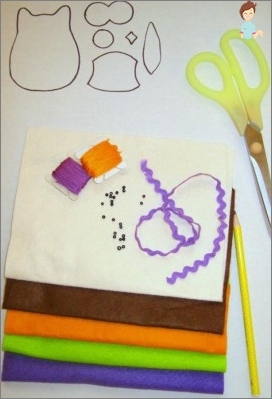 Prepare a piece of felt on a table or other flat surface. Circle the pattern along the path. First do this in a direct, and then in a mirror image. Fold the two pieces of cloth face-to-face and sew together. You can do this either manually or with the help of a typewriter. If you are using handles, use a seamBack needle, it is most suitable in this case. When stapling parts, move 3 mm from the edges of the product. While doing cross-stitching, do not forget that the cat must then be turned out, so leave a small part not sewn. When the two parts are fastened together, and you decide to proceed with the eviction of the toy, be extremely careful. To do this as neatly as possible, use either a not sharpened pencil or a handle without a rod for this. If you do not want to turn yourToy, then you can stitch the seal on the front. Only in this case, choose threads that will contrast with the color of felt. It will look very beautiful and unusual. For work, use the edge seam. Now the toy needs to be given a volume. For this, any soft filler is suitable: Sintepon, cotton wool, the remains of fabric. Armed with not a sharpened pencil or pen without a rod, slowly hammer the "body" of the cat, distributing the filler evenly over the craft. When you tell a toy a shape, remember thatA large amount of packing can damage the seams, so the filler should be in moderation. After you fill the toy, sew the remaining hole. If the eyes and nose for your toys are bought in the store, then it's time to fasten them to the product. Just do not immediately glue, first attach and see if you are satisfied with the location. And then use glue. Everything, the cat of felt is ready. If you are going to make eyes and nose of beads,Buttons or fabric, they must be sewn to the product before you fill it with filler. Otherwise, gently distribute the eyes and nose is unlikely to come out. 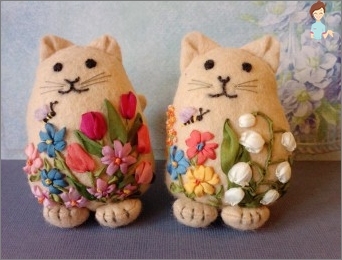 To bring a note of personality to your toys and make each of them (if, for example, you sew several cats as a gift) special, use different decorations. 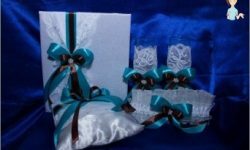 A great option will be multi-colored satinRibbons, buttons of different sizes and shapes, sewn to the body of the cat, tablets with the names of the recipient. 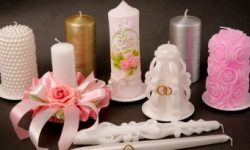 In specialized stores you can find beautiful bows, rhinestones, elder flowers and other ornaments. In general, everything here is limited only by your imagination. As you can see, to make a catFrom felt you need very little time and a minimum of skills. The toy can be made together with the children 5-6 years. This fascinating activity, of course, like crumbs, and will bring a lot of pleasure and benefit. The skills of sewing and assiduity still did not bother anyone. 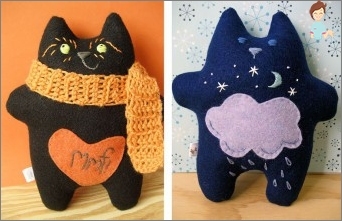 As a result of such joint creativity, a cute cat from felt that will please the eye will turn out. It is worth saying that according to the scheme described above,The toy will turn out to be small. A souvenir for friends, which can be attached to the ring, making a keychain. If desired, increase the pattern of the cat from the felt and make, for example, a doodle or decorative pillow. 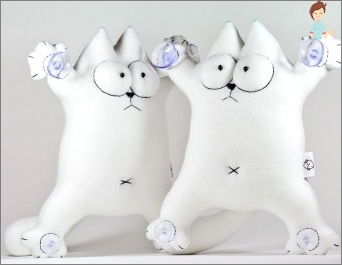 Create with your own hands unusual patterns of cats made of felt, decorate your toys, making them original and bright. Create and please your loved ones!